Many people has always been speculation about life on Mars. And we know (from the Earth itself and where this life on our planet) that life tends to flourish and evolve in places where, in principle, it is not supposed to have because the conditions for this are “dangerous” for life. Hence, even now wants to go to Io, a satellite of Jupiter plump sulfur to the bars or Europe, another satellite of Jupiter colder than the armpit of a cricket in the search for life, either as there is here in the sulfur wells (if there are bacteria) or in the high seas of Europe possible heat core satellite and the gravity of Jupiter that move and keep warm. But let’s not forget Mars. The maximum life (known) is methane, a typical product generated by bacteria, both which are in the cold pole, such as those in the wells of sulfur. Hence, it is what you’re looking for. 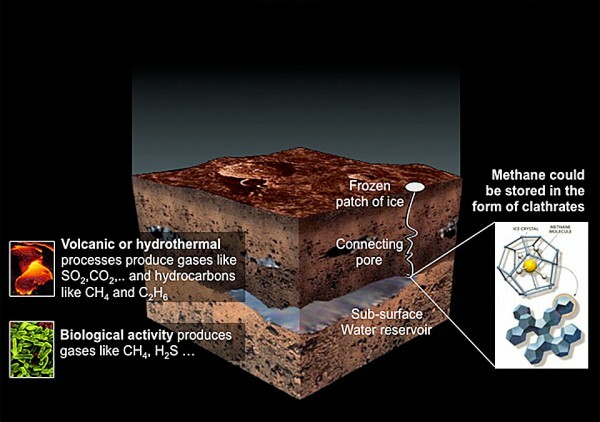 There are two theories on Mars methane found. Or is because of bacteria (here on Earth were many millennia for making our atmosphere, poor) or due to core and heat the planet joined the water in the lower layers. Whether because it is, or there is life, or there is water in abundance on Mars, something very good. Regarding that there is life on other planets, and obviously there is no question. If the basic conditions are met, a liquid where they can interact molecules and amino acids, there will be life. Before now or later. And on, as will the life that way will. Look at our planet is the best solution to know. Remember that to the same problem, the best solution we have them before our eyes. Actually, evolution is a maximum and that the best solutions are those that have managed to evolve. Legs, wings, eyes, fingers, tweezers, leaves, roots … life out there should not be very different from the Earth and do not think that if one day we find life, vary much from that of here, we are the best solution to a universal problem, the universe.